Charles Barkley has boldly proclaimed that these two teams left are the best two teams in the NBA. It’s hard to disagree. The San Antonio Spurs and the Oklahoma City Thunder will begin the Western Conference Finals on Sunday, with a trip to the NBA Finals on the line. The two teams have gone 16-1 combined so far in the playoffs, with the Spurs on a 18 game winning streak and the Thunder only losing one postseason contest to a squeaker last Friday with the Lakers. No other teams are playing as well as these two squads right now, so the consesus should be, like Chuck says, that whoever wins this matchup is the presumptive NBA champion. Maybe. We’re of two minds on this at MAMBINO HQ, but we’ve got not only our consensus decision here, but also spicy little alternative for you out there. Check it! The CDP: OKC is the model for rebuilding at the moment, but we should take a long look at the Spurs as well. While it’s hard to call it classical rebuilding when you retain Ginobili, Parker, and Duncan, there’s no doubt the Spurs have reinvented themselves over the last few seasons. After a title in 2007, they made it to the Conference Finals in 2008, but were manhandled by the Lakers. The Spurs had a top 3 defense, but a middling 15th rankeddefense. They filled out the roster with Michael Finley, Bruce Bowen, Ime Udoka, Oberto, Matt Bonner, Brent Barry, Kurt Thomas, and Jacque Vaughn. 2/3 next seasons, the Spurs lost in the first round and it was clear they needed a fresh infusion of talent to remain competitive. Fast forward to 2012 and Matt Bonner is the only role player holdover. The Spurs have added talent like DeJuan Blair, Kawhi Leonard, and Tiago Splitter through the draft while picking up Boris Diaw, Stephen Jackson, Patrick Mills, and Danny Green through shrewd pickups and trades. The Spurs arenow the 10th best defense, but the top-ranked offense. They haven’t lost yet in the playoffs or at home since April 11. Can you imagine the coverage that this would receive if it were the Heat? The media would even throw Tebow aside for that scoop. All-Star Match-ups: With Danny Green, Stephen Jackson, and Kawahi Leonard in tow, the Spurs actually have the kind of long, athletic defenders that could potentially bother KD. Tony Parker is a much bigger defensive challenge than Russell Westbrook has faced thus far and has the foot speed to stay with him. Duncan looks better than he has in years. At his best, Ginobili is one of the league’s only playmakers explosive enough to counter James Harden. 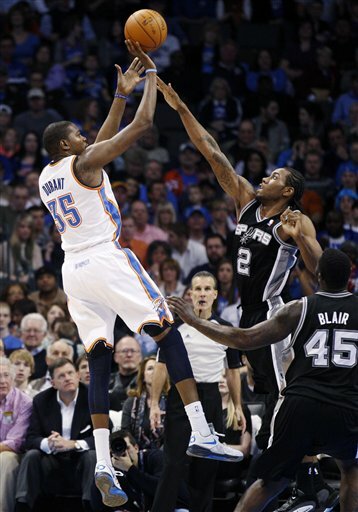 The Spurs are one of the only units in the league capable of keeping up with OKC’s Three Musketeers.